thread still there (I responded before that picture loaded, so answered in general). If this price increase is a decision taken by Travian team after a stressful meeting or after checking some stupid statistics that are never showing a complete picture of the gold sale in relation to the number of registered players, then we end up with this. Somebody who is in charge is getting a rise by fixing the crisis of 'income from gold sale' and in 2 years time end up in having 50% less income and this lovely Travian game brought to a point that cannot be saved from its downfall. I have a feeling if the gold price is going down and gold promo are offered more often, people are encouraged to buy more gold and use more and more. I hope somebody is taking my opinion into consideration. what has actually happened ? Post was edited 1 time, last by Cali12341 ( Dec 13th 2017 ). I realise that for many, I represent Travian Games, but first and foremost, I am a Travian player and have been for the last 9 years. I have also been a Mod on the UK domain for the last 7 years, I like to stay in the background and will normally only intervene on the forum when it is really necessary. I much prefer to see activity than inactivity due to conversations being killed. Today, TG announced an increase of some 12.5% to gold packages, which naturally, has created an increase in posts/threads on the forum. Some posts, should have been removed or edited but I have chosen to leave them. Players deserve to have the chance to freely discuss a potential game changer, some might say an inevitable game changer, as I have personally seen several people say that this is the final straw and there will be no more Travian for them. It has been clear for many years that player numbers have fallen substantially and Travian Games as a company, must be trying to maintain a certain income. However, I feel it is unfair to impose this on the low numbers they have on UK servers as this will surely mean a further fall in players who are willing to buy gold. I will poke @Templar Knight to see if he can fix it. None of us can see it. I or Dario will also make sure this thread is part of our weekly reports as well. You mean the weekly reports that our old FA was almost certainly adding our complaints (and our ideas to actually improve the game) to for the last 2 years and he never got a straight answer to anything that was asked and we never saw any changes? He fought damn hard for this domain and HQ gave him nothing back to prove it. Thanks to Cretin for doing the currency research, I did the exact same with comparing EUR to GBP and saw it had been flat, but I'm no business expert so assumed they would use inflation as a get out case. But as with everything Travian, they have just fudged the numbers to get whatever point across they wanted. I am also asking about that link and will look into it more in a few. Not sure what has happened there but when i open the link I go right to the sight and even copied the link straight from the sight even so really is a puzzle right now. 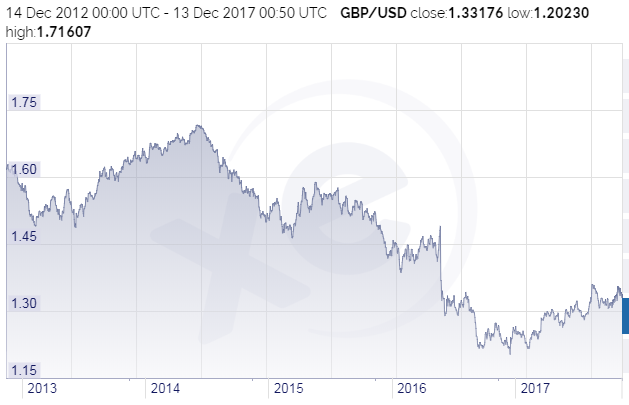 Where it shows that the GBP has dropped almost exactly 20% to the USD over 5 years. The problem, is that the USD is irrelevant. See my post here which shows GBP vs EURO and there is no change. The fact is that the USD has significantly increased in value since 2015 against almost all currencies. Benchmarking against the USD, when Travian is a EURO company, and this is a GBP server, is a false dichotomy. It is saying that your company revenue is decreasing, in terms of USD, when neither transactions or operations are in the US - because the USD is now worth more!!! Thanks Cali for your reply I don't think you should worry about that opening as a Mod. I play this game because i like to play among a lot of very good players and good friends too and obviously against other very good players too. This is more than just a simple game. This is a social thing. I'm worried about cheaters, bots, multi-accounts as they probably trying to find other ways to gain gold and substitute usage of gold by ruining the game all together just because they can't afford to buy gold, thing that i think is beginning to get worst even further. Servers are dramatically low on registered players from the beginning, making the whole stretch of each round less interesting. Numbers dropping like flies so travian hike up the price. Makes perfect sense if you're trying to kill the game off completely. Less players buying less gold even at a higher price is still less income . someone really hasn't thought this through have they. Ok first off I am a returning player who hasn't played since 3.6 (most of my playtime was before that) and I am rather enjoying myself over on S6. I don't have an issue with paying for a game that I enjoy as long as its reasonable. That being said I think when I compare Travian to most other games it is by far the most expensive game I have played by a fair whack. For instance i played Everquest for 15 years which initially cost £10 a month rising to £15 a month over the years along with 1 or 2 expansions per year at £30-£40 a pop. This works out as £200 - £250 a year and is comparable with most of other mmorpgs (albeit a different genre of game) and like Travian allows for 24/7 access (though doesn't require it). I am aware that I am a heavier than average user of gold (and yes I am aware that I could save a portion by optimising my use more) but by the end of the year I will have already spent >£200 on gold with still the lions share of the server to come. As much as I enjoy Travian it is already REALLY expensive compared to most other games already and putting the price up even more will just exacerbate that. Making a lame duck excuse of the value of the $ to put up the prices is something that annoys the heck out of me as well. I get that prices have to go up sometimes, thats the way the world works. Cost of servers, development, maintenance and staff wages only ever increase and most people understand that. What people don't like is being lied to and while I am sure that wasn't your intention when making the announcement thats what it instantly felt like to me (and likely others as well). If McDonalds put the price of a happy meal up they wouldn't blame the price of alchohol rising as the reason why they have to do it. One thing doesn't affect the other.
. What people don't like is being lied to and while I am sure that wasn't your intention when making the announcement thats what it instantly felt like to me (and likely others as well). If McDonalds put the price of a happy meal up they wouldn't blame the price of alchohol rising as the reason why they have to do it. One thing doesn't affect the other. This is where I am a bit lost as I have seen a couple other players also post about being lied to about the price hikes. Dont BBQ me as I am wanting to understand this better so I can relay that info and feeling to those I need to. The one thing I do know about this and am privy to was the fact that many of the payment systems raised their prices which is in the post and this was the main factor for Travian to raise theirs. I do agree and did let my bosses know that all the charts and graphs do not help the situation when they do not portray the picture that Travian see's on their books. I for one would have just posted about the increase without the pictures and then have the discussion we are now. So please fill me in more (without taking my head off) so I can give an accurate picture to those up the river. I read the comments and feedback regarding the Price change for the UK domain. I will add these feedback in my weekly report. The problem is that there is absolutely no reason for the US$ (or any other currency for that matter) to be involved in a purchase between the UK (£) and Germany (€). While the price increase from processors and other costs increasing is a very reasonable reason for the price needing to increase it is overshadowed completely by something that makes no sense whatsoever which also by proxy invalidates the good reason for a price increase. If I turned the music down on my kids stereo (disclaimer: I have no child myself :p) and said it was because loud music may damage his hearing then that would make sense to the child. If I then added that it was also because tomato ketchup is red then he would rightly be confused and likely think that the first reason given is also a lie and that I am just a grumpy douchebag wanting to spoil his fun. and that is why I thought the charts and graphs would do more harm then good as it does not accurately project what the increase was all about to begin with. If it confused me then I know the general players would feel the same. I am just a simple soul and sometimes easily confused by stuff I see as well. I can say though that this increase was a result of the payment systems raising their rates. This I know as fact and why I asked about the lie statement as I felt it was something to do with how the post was made. It is a tough cookie to eat and swallow and as a player myself any increase is always a bad thing. I have seen others say it too and it is true that prices are always passed on to those who pay eventually. I will damn sure to make sure that the feeling of the UK community is broadcast loud and clear about how this could have been done a bit differently. I know it is not wanted at all but it would happen eventually. As on the .COMs I will make sure this is used as a learning tool for future announcements that may be of sensitive nature as a price increase is. Thanks for the response Deaderpool as it helped in more ways then you know. I owe you a forum title for that so think hard on what you would like to have. Post was edited 1 time, last by Templar Knight ( Dec 13th 2017 ).